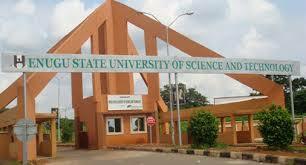 Enugu State University of Science and Technology, ESUT Students Union Government [SUG] Election Guidelines for 2018/2019 Academic Session. Following the approval by the Vice Chancellor that the 2018/2019 SUG Election be conducted early this First Semester, and after due consultation with the SUG Exco and Parliament, the closing date for the submission of the Interest-Declaration forms will end on 30th October, 2018, while the election proper holds on the 20th November, 2018. Ban on the Election Campaigns has been lifted with immediate effect and will close on the 19th November, 2018. Ensure that the guidelines of the Election are strictly adhered to. It has been observed that while some aspirants has not yet submitted the completed forms and their computed CGPA's, there are many Departmental and Faculties posts not yet applied for. Consequently, the Heads of Departments and Deans of Faculties are appealed to urge their Students to pickup the forms, apply and contest for the positions in the general elections rather than waiting to fill the offices by appointment thereafter. Let it be clear to all that no such practice will be allowed from this year's election and possibly beyond. We should begin to encourage the students to learn to go by democratic rules of election. For the guidance of everyone the list of vacant positions [posts not yet applied for] according to the Departments and Faculties has been published on the School notice board, It is hereby emphasized that the University Management places very high premium in seeing that the right things are done in electing credible students to run the affairs of the Student Union Government, SUG from the Departmental, through the Faculty to the University level. As a follow up to this memo, the Office of the Students Affairs Department will go round the Faculties and Departments to verify the submitted CGPA's and to sensitize the students on the electronic voting [e-Voting] process that has been approved for implementation this time around. Students that have applied for elective positions can come to the office of the Students Affairs Department to confirm their submission before the deadline for forms submission. Further details will be communicated to all concerned in due course as appropriate.